Summer calls for a new wardrobe and a whole new look without breaking the bank. And, what’s the best option then? Street shopping! We spend three hours on MG Road and picked up everything from dresses to top and shoes for an Insta-worthy OOTD for the season. When the temperature rises, it’s time to stock up on those easy-breezy dresses in quirky prints and fun colours. We are big fans of shirt dresses. Not only they are easy to wear, but the silhouette is versatile enough to suit all body types. For our wardrobe, we picked this monochrome pinstripe shirt dress (INR 350) and bird-print black shirt dress (INR 250) from a tiny roadside stall in front of Punjab National Bank, opposite Much More in Camp. If you’re looking for something that is pretty and cute, you must check out the gorgeous blossom print smocked dress for INR 250 that we bought from this small kiosk, opposite Ice Cream Factory. Flowy maxi dresses are in this season. Go for soft, breathable fabrics and bright hues to ace the perfect summer look. We picked this elegant black-and-white maxi with rose patchwork for INR 350 from the stall right beside Baskin and Robins. For something more classy, we picked a maroon ethnic maxi and a cherry-and-leaf-print mint green maxi, each for INR 400. What’s more? You can also go for this beautiful tie-and-dye canary yellow maxi dress for INR 450. A summer haul at MG Road is incomplete without laying our hands on pretty tops. For our regular office wear, we picked a dark blue printed top (INR 250) and a smart Oxford shirt (INR 300) from the stall near Punjab National Bank. As we walked down the stretch between Clover Centre and Dorabjee’s, we found some awesome collection of tops; from peasant cuts to lace-work, cold-shoulder and more. We picked this gorgeous aqua green Bohemian boat-neck top for INR 300, a lacy spaghetti top in pastel pink for INR 350 and an embroidered blush pink top for INR 300. And, while you’re there, don’t forget to check out cotton print tees, starting as low as 250. The best thing about racer-back tops is you can use them for the gym, wear with jeans or simply team it with your shorts. 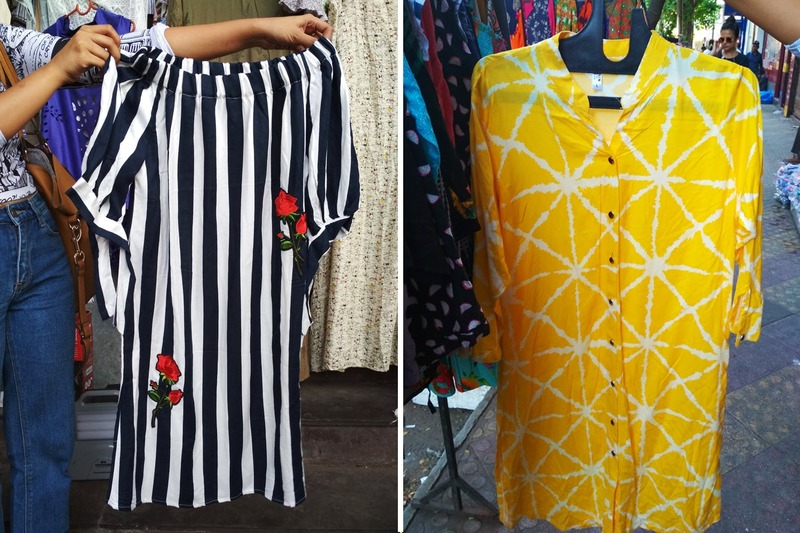 On MG Road, we found a wide collection of racer-backs in bright colours, abstract patterns and stripes, starting at INR 200. We found cute denim shorts in bold colours of yellow, hot pink and green, starting at INR 150, from this street cart right in front of Carpet Inn on MG Road. You can also look for distressed, high-waisted, cargo and floral print shorts. You don’t have a summer look on point unless you get the perfect pair of shoes to go with it. We bought these multi-colour beaded Kolhapuris for INR 250, a pair of sky blue chappals for INR 180 and a glittery golden slip-on for INR 180 from a kiosk beside Fulchand Jewellers, opposite United Colors Of Benetton. Once you are done with your summer shopping, check out these beautiful pom-pom earrings, danglers, gold hoops and jhumkas.